Capital Food Industries (CFI) is a biscuit and snack manufacturing firm which was established in 2001. Its production facility is located in Hattar Industrial Estate, KPK. The primary market for CFI is Northern Punjab, KPK and Kashmir. It operates under the brand names U&Me, FastTrack and Sohni Dharti, producing various types of biscuits and savory chips for its customers. CFI is run by a highly experienced and motivated management and sales team which ensures the highest standards of quality for our products. 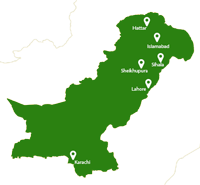 It has a vast distribution network spread across northern Pakistan. BVQI has issued ISO 9001:2000 Certification to Capital Food Industries regarding Quality Management System compliance with the standard system procedures. CFI is currently producing over 16 biscuit products, with the most popular being “Flair”, “Zeera Special”, and the “Fruit Link” brand. CFI is also involved in producing salty chips under the names “Salt Wave”, “Catchup Flair”, and “Masala Flair”. Feel free to contact us at info@capitalgroup.com.pk or click here for more information.